Austrian Airlines cargo is a commercial business transport division of Austrian Airlines. It is responsible for the air cargo marketing and sales for Austria. Austrian Airlines was founded in September 1957. The Austrian Airlines cargo operates scheduled cargo services to 130 domestic and international destinations in 66 countries. Its headquarters is situated in Vienna International Airport. ULD: Austrian cargo offers the full spectrum of suitable containers and pallets for the aircraft employed on a specific flight. Containers are AKE LD3, AKH LD3-46, ALF LD6, AMF LD36, DPE LD2, DQF LD8, RKN LD3-Cooltainer and, Envirotainer and Pallets are PAG 88, 0 x 125, PKC 60, 4 x 61,5,PLA 60,4 x 125, PMC 96,0 x 125. 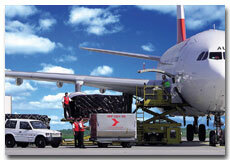 E-Services: Austrian cargo provides Internet services to its cargo division. Austrian cargo has selected Cargo Portal Services (CPS) as its global Internet platform for electronic services. Tracking: Booking and Tracking is ensured in the Austrian cargo IT-environment throughout the entire journey.